Cameron and Jon decide to make their own line of Apple Watch bands. We found 10 episodes of Making the Bands with the tag “technology”. After a short hiatus, Jon and Cameron return to talk about how sales have gone during the first month of ToneBands availability. ToneBands have been for sale officially, for 7 days and 16 hours. Jon and Cameron offer their hot takes on the first week of availability. There's no summary, no build up, no beating around the bush. ToneBands are available today at ToneBands.com. During this episode, Jon and Cameron discuss this historic event. In an abbreviated emergency episode of the podcast (due mostly to Cameron's inability to stay healthy), the guys discuss a couple potential issues that have arisen during the purchase of the first order of ToneBands. Will the order still be possible? Will the project bankrupt our protagonists? Find out in this emergency episode of the Making the Bands podcast. Very important news. Our order has been placed. Soon, we will have bands which will be available for sale on our website! Listen as Jon and Cameron discuss the process of ordering bands, setting up a website, and what comes next. And for those of you who don't get tired of listening to us talk, we've included a twenty minute rant with our opinions on Stardew Valley. 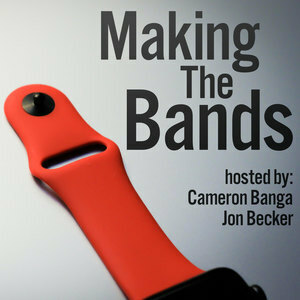 After a long holiday hiatus, Jon and Cameron are back, for arguably the most important episode of Making the Bands. In this episode, Cameron and Jon drop information on the first run of ToneBands. If you want to know which colors are available, and what they'll cost, then you'll want to hear this episode. Presidential libraries, shipping fiascos, and our final thoughts before we finalize an order of bands. We have sample band giveaway winners this week! Didn't win? We're seeing a lot of interest in bands and want to make sure that everyone who wants one can get one. So listen in at the 12:30 mark, and we have some information on getting onto a first-priority list once we have actual bands available here in the near future. In this episode, we also go through a lot of your feedback. We've received a LOT of emails, FB messages, Reddit DMs, and more. So we dive into your thoughts and comments on our process so far. As Jon and Cameron trudge towards another order of sample bands, things get off track. Topics include, but aren't limited to: new MacBook Pros, translating Chinese color descriptions from low-resolution .jpeg images, further impressions on the bands already received, and discussion about how more people would benefit from Apple Watch ownership.